Eight years ago, a poster designed by Shepard Fairey became the iconic image of the 2008 presidential campaign. The “HOPE” poster, featuring an image of Barack Obama, began with a print run of just 350, and spread after it was distributed on the street, at rallies and online. 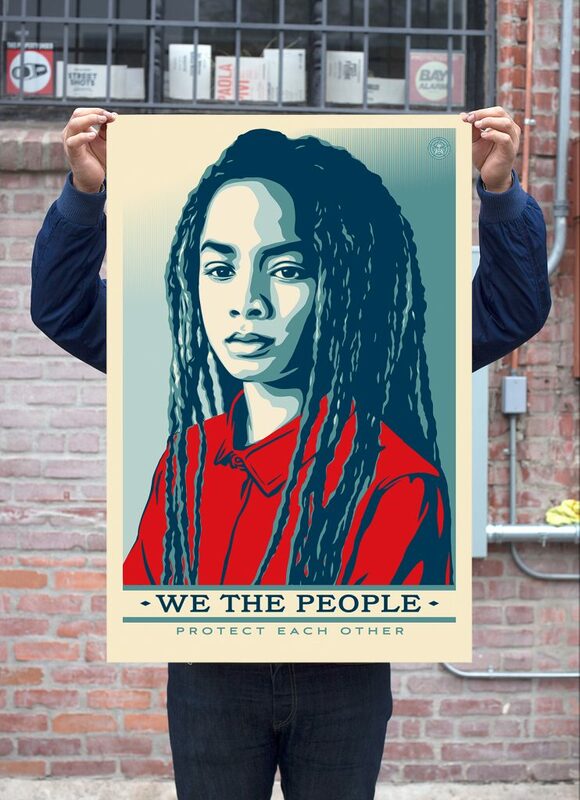 Now, the graphic artist, muralist, illustrator and activist is back with another street art campaign called “We the People” for President-elect Donald Trump’s inauguration. But this time, the new president’s face won’t be on it. Shepard has created three portraits for the campaign; two other artists, Colombian American muralist Jessica Sabogal and and Chicano graphic artist Ernesto Yerena, have each made one more. Together, they hope the faces of “We the People” — standing in for traditionally marginalized groups or those specifically targeted during Trump’s presidential campaign — will flood Washington, D.C., on Inauguration Day. Fairey is collaborating with the Amplifier Foundation, a nonprofit that works to amplify grassroots movements and which commissioned the project. After learning that large-sized signs were prohibited at Inauguration, Amplifier came up with a hack to distribute the posters. Their plan: to buy full-page ads in the Washington Post on Jan. 20 that feature the “We the People” images, which can be torn out and carried as placards, or hung and posted around town. The posters will also be distributed at metro stops, from moving vans and other drop spots on Inauguration Day, as well as posted online for free download. A Kickstarter campaign for “We the People” has raised more than $148,000 since it was launched Tuesday night. Fairey talked with PBS NewsHour by phone Wednesday about the “We the People” campaign. This conversation has been edited for length and clarity. During the primary elections, Fairey supported Bernie Sanders for president. Later, he supported Hillary Clinton, but said he didn’t find her inspiring enough to draw. After Trump was elected, Fairey wrote on his website that the country had taken “a dark turn” in rewarding incivility. Now, there’s “We the People.” How did the campaign come to be? SHEPARD FAIREY: Aaron Huey [a well-known photojournalist] and I have worked on projects before. Aaron has done a number of images around Native American rights. But he’s [a photographer who’s] not just making cool imagery. He’s heavily invested in a meaningful way. And then he started this new foundation called Amplifier. We were already collaborating, but then when Trump was elected, which neither of us expected to happen, we realized a lot of people are going to be vulnerable. There is a lot of division right now. Trump is not a healer. Art, on the other hand, is healing and inclusive, whether topically it celebrates humanity, or whether it’s just compelling visuals to make a human connection. And so we thought it was the right time to make a campaign that’s about diversity and inclusion, about people seeing the common bonds we have, and our connections as human beings. The idea was to take back a lot of this patriotic language in a way that we see is positive and progressive, and not let it be hijacked by people who want to say that the American flag or American concepts only represent one narrow way of thinking. After the Obama HOPE poster went viral, Shepard filed a preemptive suit against the Associated Press as it prepared to accuse him of copyright infringement for using one of their freelance photographer’s images of the president without permission. The Associated Press then filed a countersuit. Ultimately, they settled out of court, and Fairey also had to pay a hefty fine. For “We the People,” Fairey collaborated directly with photographers. 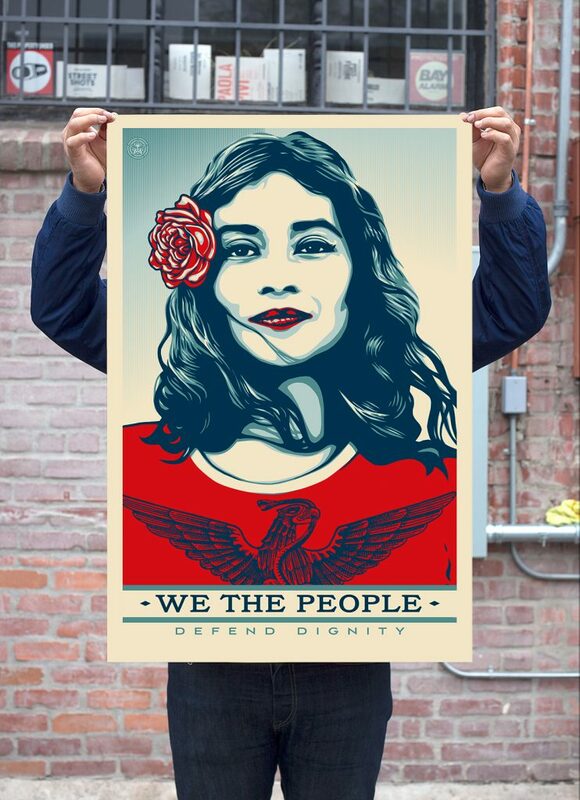 SHEPARD FAIREY: All the subjects [in “We the People”] were photographed by people who relate to them somehow. The Muslim woman was shot by Ridwan Adhami, who is an accomplished photographer and proud Muslim, the Latina woman was shot by Arlene Mejorado, a San Antonio- based artist and photographer and proud first-generation American, and the African-American kid was shot by Delphine Diallo, a French and Senegalese photographer based in New York. We realized that this has got to be a diverse coalition of artists for us to do this, and that while it’s good for us to be allies, this campaign really has to be authentically diverse. We’re getting great traction with the Kickstarter already, and we want to fund an ongoing and expanding range of creative projects, with the next wave of people from all different communities. We want to allow people to express all their social/political views around a number of issues — LGBT rights, women’s rights — because a number of those things are going to be under attack under Trump. 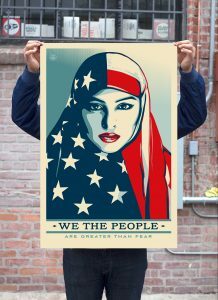 SHEPARD FAIREY: We came to a conclusion as a group that in the language [for these posters] we want to say, “We reject fear-mongering and exclusion.” But we also wanted to do it in a way that doesn’t leave the door open for the Fox News type to say, “This is reverse racism”…. It’s hard to encapsulate the complexity of what we’re facing, going into this Trump presidency, in three images. But we chose three groups that are vulnerable. In the history of the U.S., there are a lot of people who fled persecution from Europe on the basis of religious identities. The idea of championing the ideals of our forefathers and then limiting the movement of Muslims — it’s so confounding that this is not riling more people up. And so it’s really time do some [work] that I think is a counterargument to that, and that’s not based on division but based on inclusion. We’ve seen where division has got us. Just before the election this past November, Fairey created a poster called “Demagogue,” in collaboration with the Scottish rock band Franz Ferdinand, who released a song by the same name. The poster portrayed Trump, mouth open, in red and black imagery that Fairey said was meant to be Orwellian. SHEPARD FAIREY: I did the “Demagogue” poster a month and a half before the election. I think [the book] “1984” is a really important work, and presenting Trump as a form of Big Brother, I think was antagonistic but not over the top. At this point, though, we have Trump, so what’s the antidote? The antidote is not attacking Trump more. During [the tenure of President George W.] Bush, I attacked Bush, and I attacked the war on Iraq. I’ve learned from that. Back then, I got a pat on the back from my peers who already agreed with me for that work, but as for changing people’s minds, I’m not really sure we did that. When people get defensive, I think that really limits their ability to change their mind. So my solutions in this campaign are different. While the HOPE poster was made in support of Obama, and “We the People” in protest of Trump, Fairey says both have a hopeful message. SHEPARD FAIREY: The Obama poster was very sincere. I come from this rebellious subculture, where sincerity and earnestness are not always really welcome. I come from punk rock. But sometimes, [sincerity and earnestness] means you are going against the grain. When the status quo is fearful and scapegoating, then the most punk rock you can be is finding common ground with your fellow human beings. I’m also at this point in my life where I’m a really big believer in civility. There’s nothing wrong with disruption that’s ethically sound and well thought-out. Going to a town hall meeting and being uncivil is not something to be proud of. The Clash are big role models of mine, and Rage Against the Machine. Even though these guys are angry, all their arguments are grounded in humanitarianism.… But sometimes I’m cautious to make sure that my style of my delivery doesn’t eclipse the content of my delivery. After the inauguration, “We the People” will also send the five images to the new president as postcards. Aaron Huey said it was a last-minute addition to the campaign to “get the art in front of the people who need to see it most.” But Fairey hopes that by that time, the images will already have been distributed widely. SHEPARD FAIREY: Aaron [Huey] was looking at my existing model of giving away free prints and free digital downloads. [“We the People” is] an evolution of that, but a little more ambitious, with the Washington Post ad. As much as I appreciate social media and the way it democratizes things, with the physical side, there’s an impact that’s longer-lasting and more meaningful, which is why I continue to do things on the street, and make physical prints. When people get out there and they hold something, it’s different. The kind of bonds you form with other people are more meaningful, when there are actual bodies in close proximity and words being exchanged and molecules colliding. Editor’s note: This article has been updated to clarify details of the lawsuit involving Fairey and the Associated Press, and to add additional information about the photographers.